This week I decided to make a cheesy potato soup in my crock pot. Now that weather is getting cooler there is nothing like a nice hot chunky soup to warm you up. I'm going to share with you my easy receipe that I used. 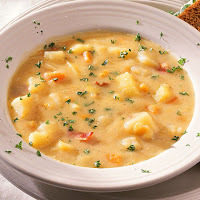 Put potatoes, onions, butter, bouillon cubes, cheese, ham and water into crock pot all day (8-10 hours) on low. Half hour before serving add milk and flour to thicken. It's that time of year again! Time to start wrapping all of those presents that you have bought and start putting them under the tree, or goodies that you have made. I have found some fun and helpful tips to make gift wrapping less stressful and to look presentable to display under the tree or to give your friends and neighbors. Cellophane Bags - Clear or printed cellophane bags (like the ones florists use for corsages) can be a lifesaver for small non-fragile gifts, candies, or baked goods. Simply insert the item into the bag (wrapped in tissue if desired) and seal the top with ribbon, raffia, cording, or a twist tie. These bags come in several sizes. Look for them in bulk at a paper warehouse outlet. Colored Tissue Paper - Tissue can make any gift seem more festive. 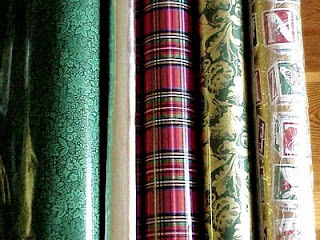 Collect several colors to use when lining gift boxes, to cushion delicate items, inside cello bags, or even to use as gift paper. Making Gift Tags - Craft and stationery stores have blank tags in a variety of shapes. You can also make your own tags in any size or shape using colored paper or cardstock. Scalloped edge scissors will also help create beautiful looking tags. The Martha Stewart website has a pluthera of crafts and ideas! I found this super cute advent calendar. Isn't that just the cutest thing ever!? 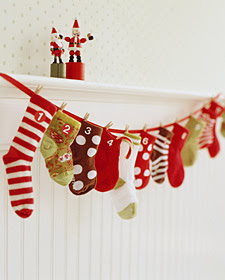 To make this adorable advent calendar go here for instructions on how to make it. And the winner of the Holiday Countdown giveaway is Lisa Gier! Congrats Lisa I will be contacting you shortly. I've been working on a new holiday project the last few days and it's almost done! Here is a sneak peak as to what it could be. Any guesses? Stay tuned for a tutorial on this holiday project! I so excited to have another guest blogger! Today's guest blogger is Kirsti from Kirstikoo. I've know Kirsti since high school and love her products and creativity. I will turn the time over to her now! Many Thanks to Danesa for featuring me on her blog today! I love these fabric pumpkins, they are so easy to make and you probably have all the supplies at home since they are made from toilet paper!! Come visit me over at Kirstikoo for the full tutorial- I promise it's the easiest project EVER! and come see more great Fall and Thanksgiving tutorials and ideas from other bloggers in my Thanksgiving Link-Up! Thanks again for having me Danesa-- Hope you all have a safe and happy Thanksgiving! I saw this really cute wreath this morning and had to share it with you. Pretty, huh!? I would totally make it but I already have an autumn wreath hanging on my front door. But if you don't have one check out Cheap Cheap Chickadee on how to make it. I'm so excited to have a guest blogger today! My friend Sarah from Lovin Simplicity wanted to share a fun fall tutorial with your today. This pumpkin was so easy to make and it turned out beautifully. I actually made two of them! I have the tutorial on my blog Lovin Simplicity. I got all of my supplies at Hobby Lobby but I'm sure you can find the same supplies at any craft store. Check out her blog daily for more fun crafting ideas!! Thank Sarah for sharing. It's time for another giveaway! I'm so excited to this one. I've been waiting for the last couple of months to do it! Remember this picture from a few posts back? Well it is part of my Holiday Giveaway! A Holiday Countdown or Advent Calendar, whatever you want to call it!! What was your favorite advent calendar growing up? Go to my Giveaway Rules on how you can win this fun prize! You have until Nov 18th to enter. On Friday morning the 19th the winner will be announced. I love reading through Totally Tutorials just to see what's new and what someone has come up. Today I saw this. This was created by Therapeutic Crafting. Go here to see how to make it. Time to bring out the turkeys. 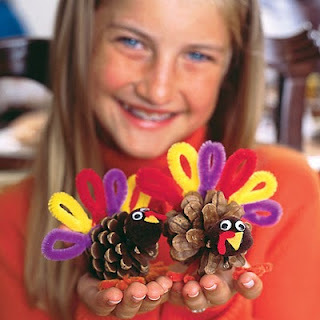 I was looking for a fun Thanksgiving craft to do with the neighborhood kids and found this cute little turkey activity. Super cute! It looks very easy and fun. Go here to see how to make it, there is even a little video that will walk you through it. I'm so excited to share with you this week's recipe, it comes from Arizona Vanilla! The brains behind this yummy recipe is my stepmom, who always seems to making up something new. Follow the manufacturer’s instructions for cooking the pie dough. Remove from oven and let it cool. In a small pot, bring to a boil the milk, extracts, sweetener, and nutmeg. In a small container, mix eggs with cornstarch. When the milk mixture is starting to boil, and reduce heat. Slowly pour about ½ cup to egg mixture whisking fast to incorporate air. This is called tempering. Pour the egg mixture into the pot with the milk whisking fast and cook on medium-high heat until thick. Do not overcook. Put the pot on ice water and add the butter little by little until all incorporated. 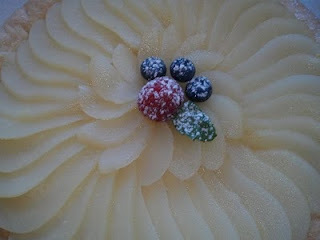 Slice the pears; pour the pastry cream in the pie shell and arrange the pear one close to another. Garnish the center with raspberries, blueberries, and mint leaves. I know that I've mentioned this before but Fall is one of my favorite seasons. 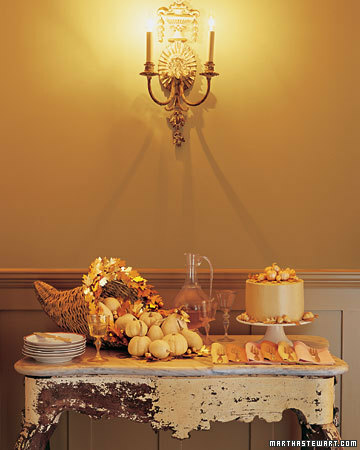 So in order to get into the spirit of fall I wanted to share with you some fall decorating tips that I have found. Scents: Fall is a great time for warm, rich scents, such as apple-cinnamon, French Vanilla, and anything related to cookies or baked goods! Just keep them away from your dining table, so that their scent doesn't overpower the tantalizing aroma of your home-cooked meal! Sorry for the week long hiatus. I had a busy week and working overtime at my day job that I just didn't have time to update. 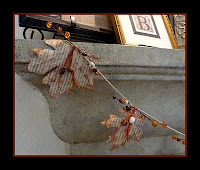 But I'm back and with a really pretty Fall Garland tutorial. 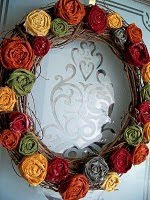 In my search to find a unique garland for fall to display on my banister I found this at UCreate. Pretty right!? I think so. Go to UCreate for the tutorial. I found a new weekend project.